Maharaji Kripalu is a great teacher, living and breathing the absolute bliss of Radha Krishn. I have become a follower of Maharaji Kripalu and a worshiper of Radha Krishn in the last few years. 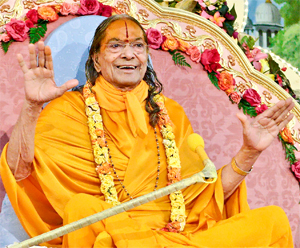 On the full moon night of October 1922, Jagadguru Shree Kripaluji Maharaj (now Maharaji Kripalu, was born in (Mangarh, (Pratapgarh, U.P., India). He was born in a Hindu Brahman family and spent his childhood in his village. His childhood, by all accounts, was normal, punctuated with love, laughter, and the occasional naughty deed. But somewhere in his childhood extraordinary virtues were noticed by the people around him. For instance, when he went to Mahu (a town in Madhya Pradesh) to start his studies in Sanskrit, he finished the entire education within two years; other students might take as long as twenty. He felt drawn, at that time, to divinity studies, which totally engrossed him. He left college, but remained a few years in the deep ecstatic states of Mahabhao in the woods of Chitrakoot and Sharbhang. He emerged from these woods where gracing those around him with Krishn love. He became attracted to the study of Radha Krishn, and the love appearing in its full charm of highest ecstatic excitement. Engrossed in these ecstatic states of Radha Bhao, it was hard for him to communicate with people. Once, in 1942 some devotees saw him in Vrindaban in this state, approached him and requested him to come to their town. In this way, he emerged as a teacher among common people. For the good of the souls, he subsided his Bhao state and gave sankirtan programs at the houses of the devotees. People observed his Divine expressions and were drawn to him. They listened to his talks and were impressed by his scriptural wisdom. In those days his stay at any place was unscheduled, so at any time he might appear at the door of any of his devotees, spreading grace to the audience by his satsang. His satsang of those days was an ecstatic state of Divine love -- of Radha Krishn love. Devotees who witnessed the Bhao of Radha Rani’s love in him began to call him Mahaprabhu, comparing his work to the Divine nam sankirtan of Chaitanya Mahaprabhu given to the people of Nadia 500 years ago. At this time a number of non-stop nam sankirtan programs were also arranged in which he revealed and detailed the devotional philosophy of Krishn love (Prem Ras Siddhant). He dictated to one of the devotees the whole philosophy with the Sanskrit quotations of scriptures, although he has never read those scriptures.